A half-century ago, residential goodwill and the generosity of a local textile mill owner put this little Gaston County town in the Christmas spotlight. Editor’s Note: This story was originally published in December 2012 and updated in December 2017. The Christmas magic is tangled. Like, really really tangled. It’s August in McAdenville. The holiday season is just a little more than three months away. 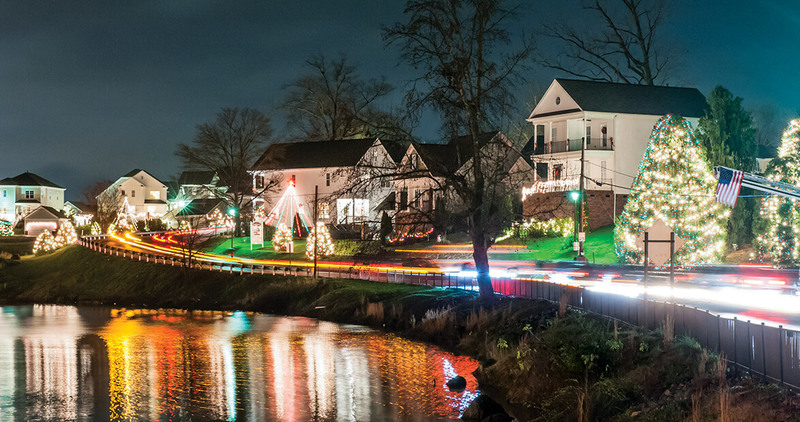 Three months until this tiny Gaston County mill village becomes, for the 62nd time, Christmas Town USA. Three months until nearly half a million lights lure people like moths. So there is work to do. A lot of work. And inside a nondescript workshop in town, a half-dozen men dig through, tug on, and twist apart green spaghetti piles of wiring. When unfurled, there’s enough wattage here to light up the entire town. That’s the way it’s been here for decades. From the first day of December until the day after Christmas, this town of barely more than 600 residents plays host to nearly 600,000 visitors. For 26 nights, a conga line of cars slowly snakes through the towering evergreens, creeping along a route that escapes Interstate 85 to ease through the valley of the South Fork River. Connect-the-dot red taillights move downhill on Main Street, turn right onto Wesleyan Drive just in front of the post office, dip down by McAdenville Lake, and then climb back up toward U.S. Highway 74. On a weekend night, the 1.3-mile ride can take hours. Traffic blocks nearly every residential driveway. But no one minds. Instead, the local residents, who can’t get out of their driveways anyway, are out on their front porches waving to visitors. And those visitors wave back from their cars, their windows rolled down, ignoring the winter wind to hear the chimes from McAdenville Baptist Church, the echoes of spontaneous caroling, and the never-ending shouts of “Merry Christmas!” People come from every corner of the Carolinas and beyond, eager to be enveloped in the music, glad tidings, and the source of McAdenville’s enchantment — the signature red, white, and green lights that drape from nearly every porch and hang from nearly every tree. “Christmas isn’t Christmas until we’ve seen those lights,” Lea Newnham says. During last year’s annual lighting ceremony, she and her husband, Paul, stood on the front lawn of the YMCA and accepted the keys to the town and honorary citizenship. The Newnhams, you see, don’t live here. They live in Crawley. No, that’s not just outside of Littleton. It’s just outside of London. As in England. They came over in 1998 wanting to experience a genuine American-style holiday. They’ve missed only two years since. But to create the magic of December, there first must be the maddening processes of summer and fall. The man in charge of this giant collection of wires and lights is Tim Gibson, head of the volunteer McAdenville lighting team. And, boy, does it take a team. Yes, just a wee bit more. Somewhere in the neighborhood of 450,000 bulbs in all, covering a total of 375 trees in carefully installed patterns that vary from 500 to 5,000 lights, depending on the size of the tree. Volunteers test each strand. Lights get plugged in and flicked on. Any bulb that refuses to cooperate is immediately unscrewed and replaced. Click. Buzz. Blink. Fizzle. Toss. Replace. Repeat. Some longtime residents say the birth of Christmas Town USA happened in the early 1950s when a group of five men fashioned a giant “Merry Christmas” sign from metal piping and placed it on the hill above the volunteer fire department along the lake. Others claim that the first case of exterior illumination was a solo effort in front of McAdenville Methodist Church. When a would-be Grinch stole the lights, a generous offer by William J. Pharr, owner of the local textile mill, to replace them led to the sprouting of lights all around town. Still others insist that the original tree motif, the pattern that all others have been modeled after, actually debuted in front of the headquarters of the mill before 1956. And a final notion is that the birth of Christmas Town USA came in 1956, when members of the local Men’s Club, most of whom worked in the textile mill, decorated nine trees in front of the McAdenville Community Center. But no matter which origin story one believes, the perpetuation of the lights leads back to one man: the mill owner. “Mr. Pharr was so much more than the typical mill owner you might know from other mill towns in the Carolinas,” says Mel Collins, unofficial spokesman of Christmas Town USA and vice president of human resources at Pharr Yarns, still the town’s largest employer. And so, house by house and tree by tree, the decorative lights began to spread. So did word of what was happening in the little-known town just west of Charlotte. Soon the cars started rolling through. With each year, there were more lights and more visitors. And, as promised, Pharr picked up the tab, including paying the escalating power bills. Even now, years after Pharr’s death in 1981 and after his company spread into offices as far away as California, the mill has managed to maintain roots in the community during an era when so many other Southern mill towns have lost their factories and the identity that came with them. The strongest of those roots is still a strand of Christmas lights. And Pharr Yarns still underwrites it all. After a trip to Europe — most place it in the late 1950s — the Pharrs brought back another idea. They instituted a Yule Log parade and lighting ceremony for the start of every holiday season. The log is placed on a wagon and pulled down Main Street by dozens of local children, their parents frantically trying to keep up, to the Community Center. That’s where William Pharr would light the Yule log on fire. Now the center is Legacy Park, where a more modern lighting ceremony takes place, and Pharr’s grandson, Bill Carstarphen, welcomes guests. With the help of a lucky student chosen from McAdenville Elementary, they throw the switch, an entire town applauds, and for 26 days McAdenville becomes Christmas Town USA. Catherine Ann Carstarphen, now 84, beams when she talks about her parents and their lasting, glowing legacy. She recalls how her father, grandfather Robert L. Stowe, and uncle Daniel Stowe, purchased the McAdenville Mill in 1939. When they reopened the shuttered building, it saved the town founded in 1881 by its namesake, Rufus Yancey McAden. Three years after opening his McAden Mills, the former state politician and post-Civil War bank president splurged on a curious new device for the factory. It was a Thomas Edison generator, one of only a handful in existence, and connected to it was one glass bulb, less than five years removed from Edison’s first public unveiling in Menlo Park. When word spread that it was in McAden’s mill, people began showing up from all over the Carolinas for no reason other than to gaze at the lone electric candle. “It’s pretty amazing that happened way back when it did, isn’t it?” Gibson says, reacting to a story he’s heard more than a few times before. Then he curls his lip into a little smile. McGee is a senior writer for ESPN the Magazine and the author of The Road To Omaha: Hits, Hopes and History at the College World Series, and ESPN Ultimate NASCAR: 100 Defining Moments in Stock Car Racing History.